Milano Unica announced the debut of its new e-milanounica digital edition starting on Friday February 8, 2019, at the closing of this edition. A fresh energy pervaded Milano Unica, the Italian fabric trade show held in Milan Rho-Pero February 5-7, 2019. Despite this, the show registered visits by 6,000 companies, a result in part due to Chinese New Year’s celebrations happening. Though this edition showed a great richness of ideas, innovative products and projects mostly focused on sustainability and technical wools. The show announced the debut of its new e-milanounica digital edition starting on Friday February 8, 2019, at the closing of this edition. Its own pilot project is hosting 60 digital friendly companies ready to present their products to buyers after the show has closed. “Keeping our doors open every day, 365 days a year, is important,” explained the show’s president, Ercole Botto Poala. The show hosted 467 companies, including 31 from Japan and 15 from Korea. Of the remaining 421 European ones 80% (341) were Italian and 20% (80) foreign ones. The show continued to underline the importance to produce according to sustainable criteria. Out of its total number of exhibitors, 120 presented 700 fabrics within the special section Sustainable Innovation that was part of the general trend area. Iluna has managed to produce ecofriendly laces. Many companies showed some of their greatest technical advancements. Among them there was Iluna, an Italian lace manufacturer that has managed to produce high-quality GRS and STEP certified laces by recycling nylon production remains. Among the Japanese companies focused on eco-friendly were Shinohara Textile that offers denims made with Tencel and organic cotton and Yagi &Co. presenting organic and recycled cotton fabrics. Vivolo developed a new series of leather labels carrying silicon applications. Although the show hosted very few denim manufacturers, it presented Vivolo, an Italian specialized leather label manufacturer founded in the 1970s and appreciated by many jeanswear brands. Vivolo developed a new series of leather labels carrying silicon applications and a variety of leather labels that can be of different thicknesses according to the weight of denim they will be applied onto. Also new are a series of handmade leather tags carrying unique handmade elements and a special leather tag that is made with a thick cow leather layer from crust to hairy surface. Many wool manufacturers have opted for offering always more varied selections of fabrics that are added with stretch fibers and technical membranes conveying extra functional properties to their highly sophisticated and now always more performance-driven fabrics. Among them are Reda offering its Reda Active Phase using PCM (Phase Change Material), a technology that keeps body temperature constant despite changes of external temperature, and Reda Flexo, sustainable smart stretch fabrics. Reda: Sneakers made with Reda Active technical wool. Tollegno 1900 offered its 3D Wool fabrics in mono- and bi-stretch wool variants including a vast series of bright and summery ones. Vitale Barberis Canonico bet on “21 Micron” selection of wools guaranteeing perfect fit suits. It also offered a series of highly functional wools that can be worn by urban commuters guaranteeing all-day-long elegance, perfect comfort, breathability and high shape-retention. Tollegno 1900 offered its 3D Wool fabrics in mono- and bi-stretch wool variants. Bonotto offers a vast selection of wool crepes while Botto Giuseppe bet on compact denim-look and “elephant skin” effect stretch wool fabrics. 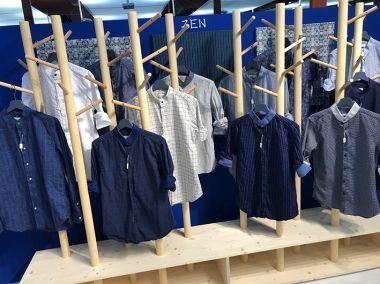 Among shirting manufacturers Tessitura Monti presented a vast selection of cotton and linen fabrics including heavier ones for overshirts and highly functional variants as, for instance, 37.5 Technology, shirting fabrics with thermo-regulating properties.